Mary has every reason to fear the appearance of Gabriel. Every demure depiction to the contrary, the Angel Gabriel’s “annunciation” to Mary is no private affair. It’s a public matter of the first order. Gabriel is the archangel commissioned to destroy the offspring of the rebellious angels and human women. (see below). Mary shrinks back. 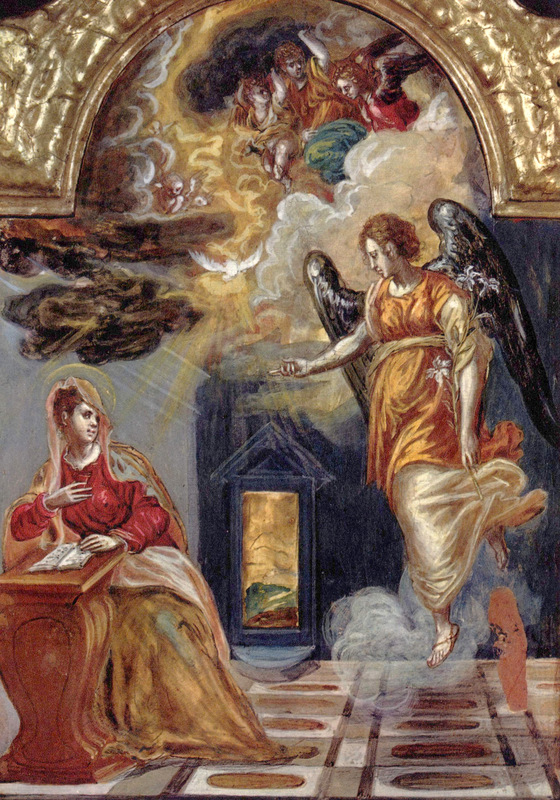 El Greco’s painting of the Annunciation illustrates the problem of textual interpretation. Gabriel’s appearance is not frightening. It’s very…how shall we say? Feminine. Even to the point of appearing perhaps pregnant himself. The great masters did not paint an angel messenger as male, even when his name is Gabriel or Michael, the only two angels named in Holy Scripture. Gabriel in Hebrew means “God is my Warrior”. Gabriel is a warrior angel, announcing to Mary that she too is to become a warrior, a mother whose birth-giving will lead to conflict with the Empire and the religious authorities who collaborate with it. As described by New Testament scholar Carol Newsom, any annunciation by Gabriel inspires fear. In the Book of Daniel, Gabriel is preeminently an angel of eschatological revelation. He is sent to Daniel to explain a vision of ‘the time appointed for the end’ (Dan. 8:15-26)…. Gabriel’s functions are more varied in I Enoch. In the Book of the Watchers (I Enoch 1- 36) he is listed as ‘the one of the holy angels who is in charge of paradise and the dragons and the cherubim (20:2). He is commissioned to destroy the offspring of the rebellious angels and human women (10:9-10)…. So why does Gabriel look the way he does in the art museums and literature of Christian interpretation? Why does the original Gabriel look so benign? And why does Mary look so calm, perhaps even demure, as in El Greco’s Annunciation? The Jesus story has been neutered. The End Time has been re-interpreted by the Constantinian Church as a paradise beyond time, a state of afterlife, not this life. In no way political. In no way economic. In no way conflictual. Peaceful. Serene. Calm. Quiet Passive. “Let it be to me according to your word.” Never disquieting. Never disrupting. Never revolutionary. Gabriel has been transformed, neutered, emasculated, rendered harmless by the Constantine religion whose adherents can no longer see the conflict between Christ, or his mother, Mary, and his father, Joseph, with the systems of unbridled greed and poverty under which they live. The Gabriel spoken of in most pulpits is not the Angel Gabriel that came to Mary. We’ve turned Gabriel into our own image. But though we may tame him in our hearts and minds, our paintings and our sermons, we can erase neither the need to be afraid nor his invitation to fear not. Gabriel’s finger points at us, asking whether we will rally to the trumpet sound, the sound of his coming. We can repaint the young girl Mary as an icon of passive obedience and tranquility. But it will be a different Mary than the courageous one painted by the Gospel of Luke. “Then the angel departed from her” for parts unknown to make his visits down through the ages, making the impossible possible. Word has it he appeared last week in Washington, D.C. and Havana, Cuba to turn the impossible into the possible, a new Order being born from the old. If you listen with faith, you might hear him. If you look, you will see him. This entry was posted in Faith, Life, Sermons, Spirituality, Theology, Writing and tagged Angel Gabriel, Book of Daniel, Cuba, El Greco, Gordon C. Stewart, Havana, Mary, The Annunciation by Gordon C. Stewart. Bookmark the permalink. Amazing! I learned, was inspired, and appreciated the touch of optimism. Thank you, Mona. The sermons keep coming. It’s been my venue for a log time both with a pulpit and without one, as at the Legal Rights Center when I wrote “sermons from exile”. Merry Christmas to you, Mona! Need to come back to this one to read, and then reread…. Ideas, phraseology, interpretations. and of course, Constantine’s role… , and how roles have changed through time…. Hmmmmm. Take your time. Enjoy, critique, mull over. Fine sermon. Maybe you should consider coming out of retirement! Philo and Tolono PC are considering yoking: nice manse 3 miles from our house! Thanks, Steve. Love to live three miles from you and Nadja. Not a chance! Kay retires TOMORROW! Then we’re on the road. Congrats on Kay’s retirement yesterday. Have a fun trip. Gary, thanks for the good wishes. We’ll be around for six more days. Coffee is in order. The most amazing thing you do is to make clear the relevance of Bible events & people talking to us is that the passing of time doesn’t diminish their meanings for us. Thanks again Gordon. Gary, Made my day. Just because one is retired doesn’t stop the juices from flowing. Thanks for the encouragement to keep on keeping on.